Lentils sort of baffled me – how does this tiny legume pack such a flavor punch!? (to which you’re probably thinking, “duh Amy, ever heard of caviar?”) I know these healthy little guys make a killer soup or warm salad but I wanted to see them in something different. 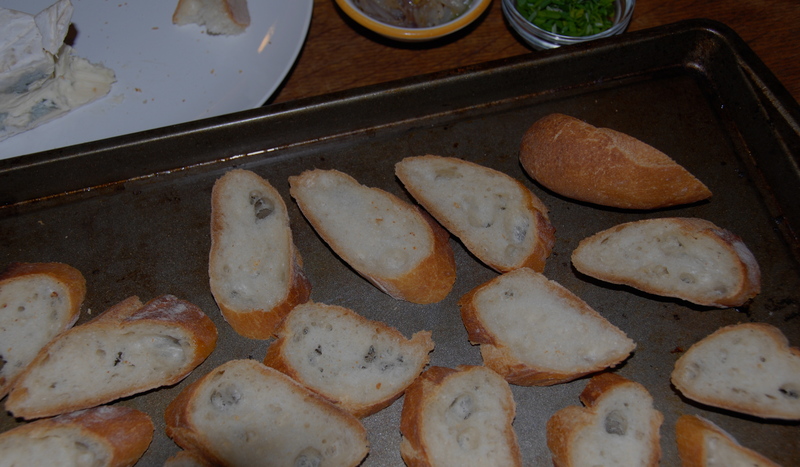 Hence, the crostini. I had purchased some Saga brie blue and thought they’d play together quite nicely so I grabbed a baguette, a few other ingredients and the lentils n’ blue crostini was born. I used green lentils from Le Puy A.O.C. – that’s right, The French grant lentils the same protected agricultural status as their great wines – pretty special huh? These little bites would also be a fantastic appetizer or hors d’oeuvres – play around with the components – so many options! 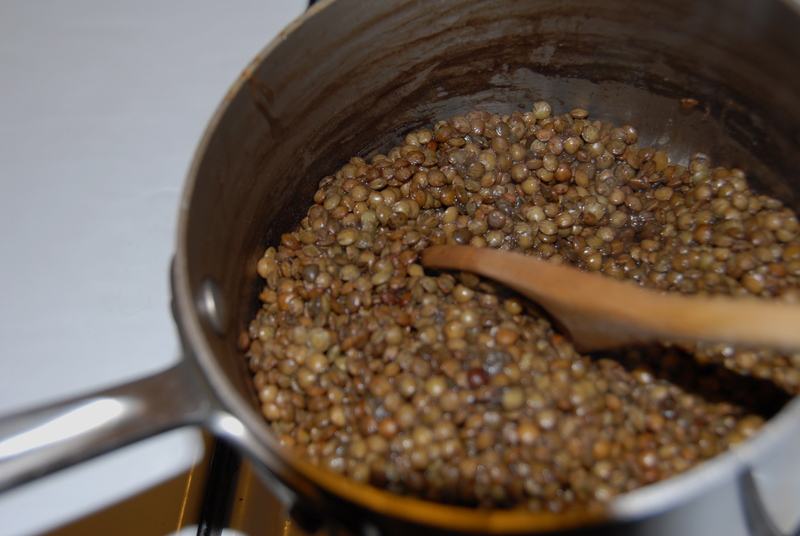 First cook the lentils – using the ratio 1 part lentils : 2 parts liquid. Bring the liquid up to a boil and simmer for about 20 – 25 minutes until the liquid has been absorbed and the lentils are soft but still have a little bite. I really liked the mushroom broth with the lentils but you could use chicken stock, water, whatever you have on hand. Season with S&P. Meanwhile caramelize the shallots in butter. Lots of butter, low and slow, and maybe a little dash of sugar. Season well. Set aside. Slice and toast the baguette until slightly brown, brush with a little olive oil or butter if you’re so inclined. Finally, assemble the perfect bite: toast, cheese, shallot, lentils, chopped chives and Maldon. You’ll be surprised at what great rich flavor these have. Earthy, salty, lovely. Note: the cup of lentils will make more than enough for a baguette’s worth of crostini and then some – use the rest atop salads, make into a soup, whatever you please! 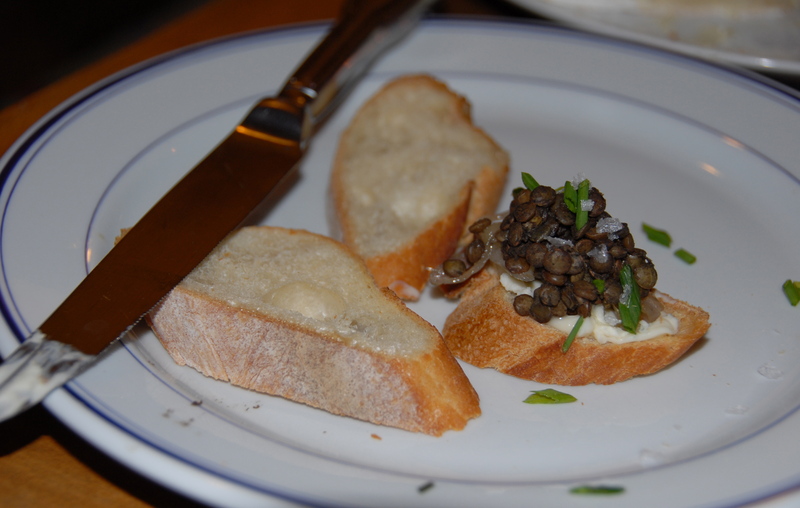 This entry was posted in Lentils and tagged baguette, blue cheese, chives, crostini, lentils, Saga, shallot. Bookmark the permalink.